Graduating with a single degree in four years is no easy feat. So imagine graduating with four. Jin Zhang did exactly that, earning four degrees in four and a half years, including a Bachelor Arts degree in music performance (cello). In addition, the international student from Guangdong, China, received her master of science degree in information sciences and technology this spring. She also earned two bachelor’s degrees in the College of Information Sciences and Technology – one in IST with an option in design and development, and one in security and risk analysis with an option in information and cybersecurity. “I was (originally) imagining becoming Yo Yo Ma someday,” she said, speaking of the French-born American cellist who was a child prodigy who began performing at the age of 4. When she was 15 years old, Zhang’s youth orchestra traveled to the Lancaster Academy of Music in Lancaster, Pennsylvania. There, she met cello instructor Sarah Male, who saw talent in Zhang and invited her to move to the United States to study. Zhang received permission from her parents and moved to America, spending half her time studying at Lancaster Mennonite High School and half at the music academy. She then skipped her junior year of high school and began to look at colleges. 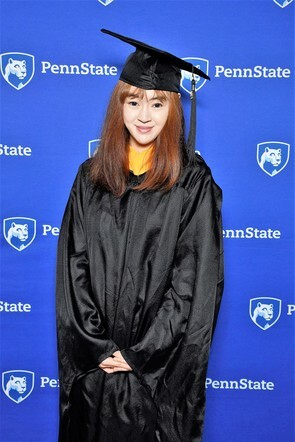 Jin's uncle, a computer science professor at Princeton, encouraged her to seek out an additional major in addition to her musical passion, so she explored Penn State and IST. “I was looking for a university where I wouldn’t have to abandon cello, but I could do both,” she explained. With a master’s degree now under her belt, Zhang has traveled back to China to spend time with her family and to begin her career. At the time of her graduation, she had interviews lined up at two leading Chinese tech companies. This spotlight was edited from an article written by Jessica Hallman, appearing in the May 17, 2018 issue of Penn State News.